Welcome to another episode of #ThatBusinessShow with your host, Jamie Meloni! We had an excellent show today, and we welcomed three wonderful guests on the show. If you missed #ThatBusinessShow this morning at 8am on 1250whnz, you can head over to http://www.tampabayradio.com to listen to the show or check out any of our past guests. #ThatBusinessShow has had a many great variety of people on the show, and will likely have any service you’re looking for on the guest info tab. 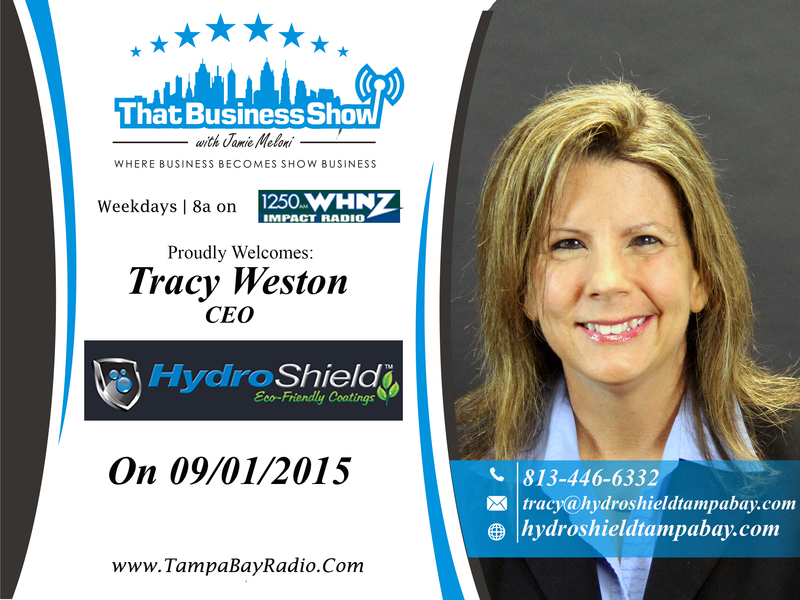 Today on #ThatBusinessShow we had on Tracy Weston, CEO of HydroShield Eco Friendly Coatings on our first segment. Also joining us was Walter Peek, CEO of Residential Acoustics; and Peter Mulry, President of the Peter J. Mulry Foundation for children. We had on Stella Guidicelli once again as our co-host, and Jamie and her spoke a little about not getting enough sleep, but they’ll be okay with some coffee. Remember that if you missed the show, you can listen to it on demand at http://www.tampabayradio.com, or head to my YouTube channel at http://www.youtube.com/jamiemeloni to watch the live video! Thanks again for tuning into #ThatBusinessShow with Jamie Meloni! Opening the show with Jamie and Stella was Tracy Weston, CEO of HydroShield Eco Friendly Coatings. Tracy helps homeowners and business owners alike to beautify their homes and offices in a very cost effective manner. Her business, HydroShield Eco Friendly Coatings – offers many different services, and has expanded to provide professional cleaning. They specialize in the environmentally friendly sealing of hard surfaces such as granite counter tops and any stone flooring that leaves a pristine shine. This environmentally safe coat protects surfaces and also prevents bacterial growth! And better yet, the coat can last up to 15 years! Tracy tells us that the special coating allows her customers to use environmentally friendly cleaning products and protect their families from harmful chemicals. Tracy is a true entrepreneur, what #ThatBusinessShow is all about! You can find out more about Tracy and check out HydroShield Eco Friendly Coatings at http://www.hydroshieldtampabay.com or email her at 813-446-6332. 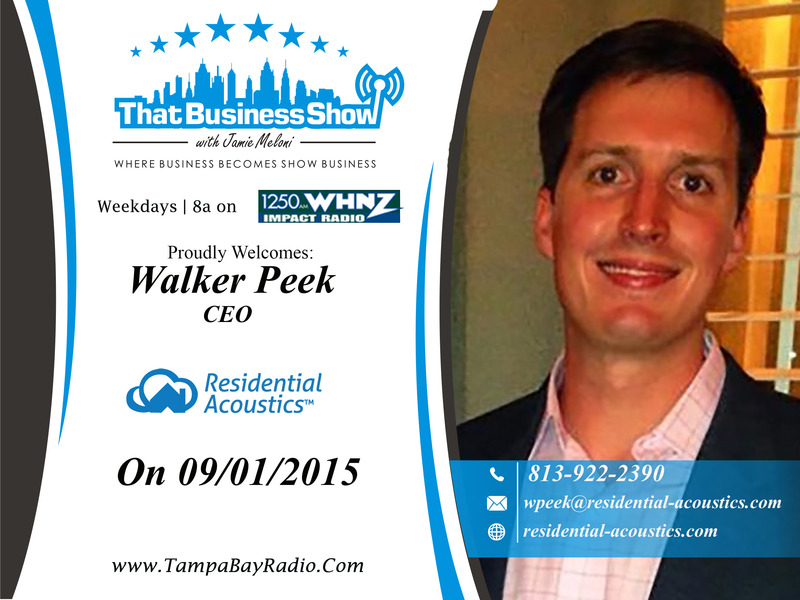 On the second segment, we welcomed Walker Peek, CEO of Residential Acoustics. Residential Acoustics is a company that prides itself on improving the quality of people’s lives. Have you ever not been able to sleep because of a noisey highway right outside your window? Residential Acoustics offers many solutions to this. Residential Acoustics specializes in noise dampening solutions that can muffle over 90% of all noises in and around your home in a cost effective manner. Walker spoke to us about his new noise canceling curtains, a simple yet effective solution that is more feasible that double pane windows. His technology has helped people in big cities all around the world and in small towns with busy roads. Entrepreneurs like Walker Peek are always welcome on #ThatBusinessShow, and can leave us a message on http://www.tampabayradio.com! You can find out more about Walker and Residential Acoustics on their website at http://www.residential-acoustics.com, or email him at wpeek@residential-acoustics.com! 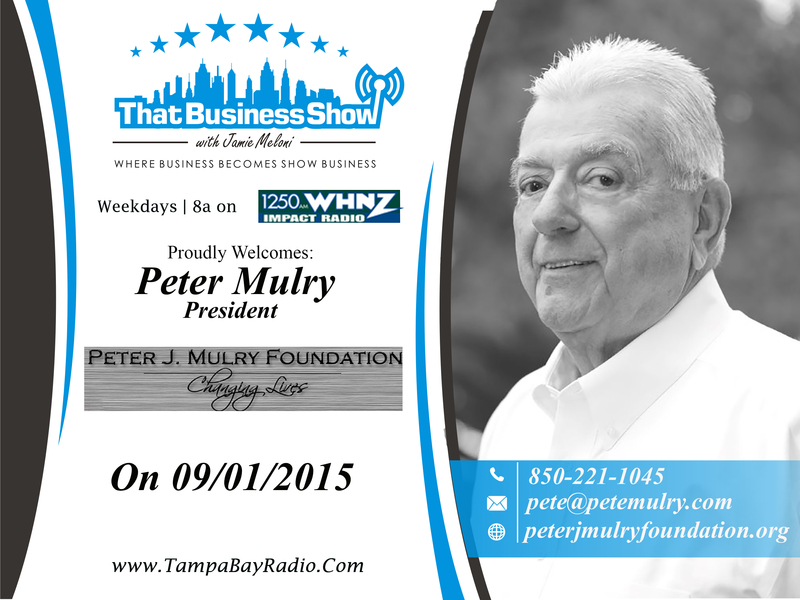 Our last guest on #ThatBusinessShow was a man of the people; Peter Mulry, President of the Peter J. Mulry Foundation for children. The Peter J. Mulry Foundation for children focuses on teaching kids the values of teamwork, responsibility, and accountability through the good old american past time, baseball! The Peter J. Mulry Foundation for children hosts special clinics that bring many baseball and softball players to work with children in schools to teach them values that will impact their entire lives, and educates children to make smart choices with regards to drugs and alcohol. Peter was the baseball coach at Tampa Bay Catholic, and played many years himself, together with his team they won many baseball state championships and even a national title. He was recently inducted into the Tampa Bay Baseball Hall of Fame, and now spends his time on helping “The stars of our future”, our community’s children. You can find out more about Peter and the great work he is doing with the Peter J. Mulry Foundation for children for our community at http://www.peterjmulryfoundation.org, or email him at pete@petemulry.com! This entry was posted in Articles, Entrepreneurship and Business and tagged Baseball, business, entrepreneur, show business. Bookmark the permalink.